"In the ocean, the mighty ocean, the Lion swims tonight......."
Following my break to catch the Shanghai Formula One race, I was back on the plane headed back to D0ngGuan. That's when I learnt about the Lion Air crash at Bali from the headlines of the newspaper given out by the flight staff. Anyway, it was great to hear that everyone was fine. Indonesian Airline safety has always been a joke. 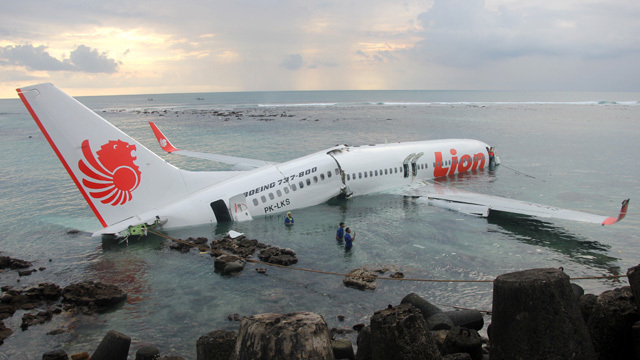 Indonesian airlines were, at one time back in 2007, banned from entering EU due to overly poor safety record. I have had make several jokes about Indonesian Airlines and here's a flash from the past. JayWalk Online (16 Feb 2006) - AdamAir - AdamWhere? Our very own Merlion with the tail flipped in the other direction. Either one is a creature meant to be under water. Not exactly a logo of good omen for an airline. Perhaps, it is no surprise to find the plane in the water. Perhaps the Lion Fish/Merlion misses home?